Now that we're well into winter, we thought you might enjoy some INCREDIBLE new soup recipes to warm up your life. WE LOVE THESE SOUPS SOOOO MUCH! 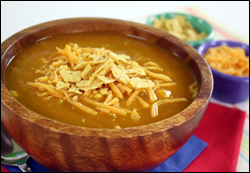 Extra-special thanks to Pam, who inspired us with her swap for Chili's Chicken Enchilada Soup. YOU ROCK, Pam, and so does this soup! In a large pot, bring broth to a low boil on the stove. Add celery and onion, and simmer for about 5 minutes, until slightly tender. Stir in enchilada sauce and pumpkin. Once soup returns to a low boil, add chicken and corn, and mix well. Cook for an additional 3 - 5 minutes, until soup is heated throughout. Add a dash or more hot sauce. (Or not. It's your soup.) Serve and, if you like, top with shredded cheese and/or crushed chips. Lay three wonton wrappers flat on a clean, dry surface. Scoop a spoonful (about 2 tsp.) of filling into the center of each wrapper. Moisten all wrapper edges by dabbing with water. Fold the bottom left corner of each wrapper to meet the top right corner, forming a triangle and enclosing the filling. Press firmly on the edges to seal. Set aside, and repeat with remaining wrappers and filling. 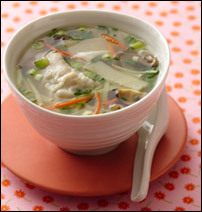 Carefully serve up wontons and broth. Slurp 'n chew, people! Need a big pot of soup PACKED with veggies (not calories! ), but don't want to spend forever chopping? 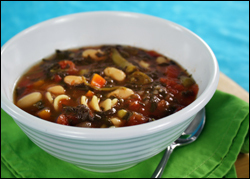 This recipe is a DELICIOUS shortcut to Soupville! Combine all ingredients in a large pot on the stove. Add 1 cup water and stir it up. Cover and bring to a boil. Reduce heat to low and allow soup to simmer, covered, for 10 minutes. Remove bay leaf, add salt and pepper to taste, and serve! These recipes are life-changingly good. Pass this email on many times, and you'll make people's lives better. So click "Send to a Friend" RIGHT NOW!